Life Saver’s pool fence is a removable mesh pool fence designed specifically to provide a barrier around residential swimming pools for toddlers and young children. 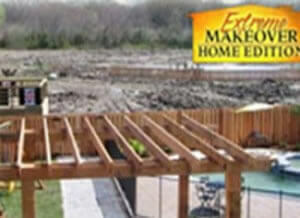 The fence is installed in sections to provide convenience for easy removal and reinstallation by you, the homeowner. Available in 42, 48, or 60 inch heights. We can also create custom heights for dogs. Our tension based system utilizes a series of 15 foot sections of fence with inserts for mounting in non-conducting polypropylene sleeves core drilled 4 inches deep into a concrete deck or other substantial surface, connected in series at the top with 2 1/2 inch nickel-plated brass safety latches with stainless springs. What does this mean to you? The fence remains sturdy by tension supplied from our brand new solid reinforced aluminum poles that slip into your deck. Pool fencing can be installed in almost any type of deck. If you have questions, let us know. Life Saver Pool Fence has a Lifetime Warranty on every part of the pool fence against any manufacturer’s defect. No legitimate warranty claim has ever been denied. 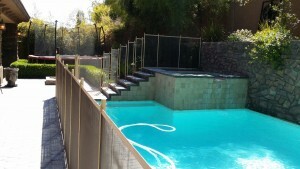 In the unlikely event that you have any problem for as long as you own your pool fence, we guarantee your complete satisfaction. And since we’ve been in business for over two decades, you can be assured that we’ll be around to help you years down the road. 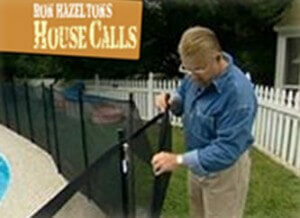 Be sure your pool fence has a Lifetime Warranty. Life Time: For as long as the original owner uses this fence. Textilene mesh provides a non-climbable surface. With a tensile strength rating of over 270 lbs per square inch. Children are not able to get a foot hold. These foot holds are present in barrier fences such as chain link or tornado fencing. The dark edges surrounding the mesh are nylon borders. If a child were to grab the border it is flexible enough so that the child will just droop back to the ground. The memory fabric will then pull tight again. Poles are constructed of heavy gauge aluminum and can come in either black powder coated, brown powder coated, white powder coated, green powder coated, tan powder coated, or our new Copper vein brown or black. Independent testing in the United States and France have shown our Solid Core aluminum poles to offer far more strength than is required by strict local ordinances around the world. Pole spacing is optional at either 30 or 36 inches. Be sure your pool fence has Solid Core Poles. Round head stainless steel screws are utilized for securely attaching the aluminum cove molding to the poles and mesh. Round screws are less likely than hexagon shaped screws to cause abrasions. Be sure your pool fence has round screws. Standard sections supplied are 15 feet making it easy for you to remove and reinstall the fence. A standard section weighs only 14 lbs. The poles’ surfaces are finished for handling and to prevent injuries from physical contact, and all poles are capped to provide a neat finished appearance. 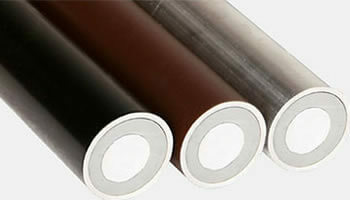 Each aluminum cove molding strip is rounded down. Be sure your pool fence has no sharp parts. All the colors of our poles are powder coated. This makes them fade, scratch, chip, and peel resistant. Living up to a highest standard of fencing. Easy to use. Convenient and Safe. 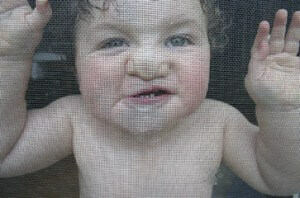 Attractive. Life Saver’s self-closing, self-latching gate utilizes a square or arched frame that can support itself with or without the pool fence. It is totally removable or it can be permanently anchored. The gate is constructed of 1¼” aluminum square stock with a strong 1/8” wall. The welded finished product is powder coated in brown, black, white, green, or tan with your choice of brown, black, white, or green Textilene™ mesh – the strongest available. Mix and match color combinations on the frame, mesh, and border to suit your personal taste while still maintaining the highest level of safety. 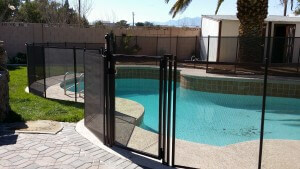 We are now offering an aesthetic upgrade EXCLUSIVE to Life Saver Pool Fence: the Arch Top Safety Gate. This gate has a unique arched top, making it beautiful and elegant. The welds are unbreakable and have full square aluminum tube components. You’re going to love how the added convenience, the improved security, and the look of this gate offered only by Life Saver enhances your pool safety fence. Conventional swimming pool gates may comply with regulations that place the latch release mechanism at least 5 feet (1.5m) high. But, kids are clever. They’ll figure out how to use a rake or other simple tools to lift the latch knob and allow the gate to open. 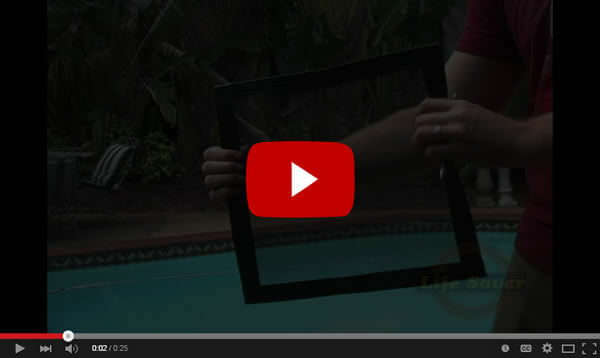 What makes the TriLatch system special is that two actions must be performed at the same time. First, the red release button must be pressed in the center of the knob, and after that, the knob has to be lifted in order to gain entry. This simply can’t be done with a garden tool, toy or other long objects. The third level of safety is the pool gate lock. 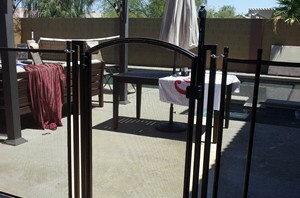 TriLatch gates are easy to lock or unlock even when carrying towels or pool toys. This convenience is provided by having the pool gate lock placed at waist level. As an added safety factor it can be latched without the key. Close the sale by explaining to your customer that when the gate closes; its powerful magnetic latching system keeps it latched – even if it is slammed. 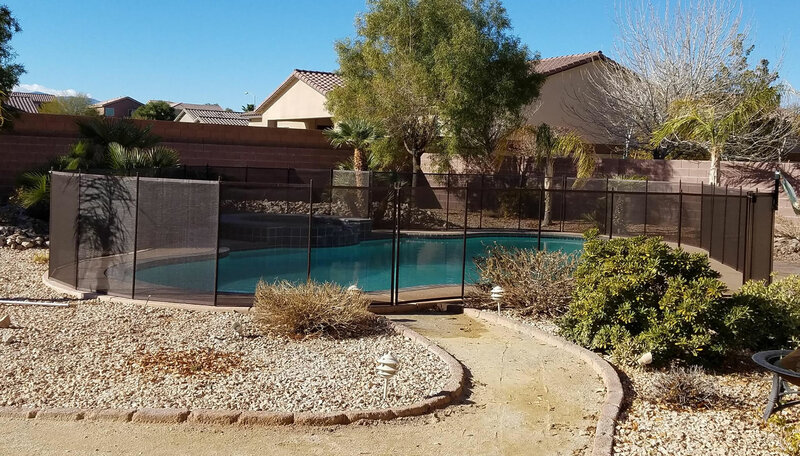 Life Saver pool fence is constructed with Textilene® polyester mesh fabric utilizing a mildew resistant polyvinyl coating that provides years of use in the harshest sunlight and the extreme heat of the Las Vegas summers. It’s woven with a continuous basket weave that boasts an incredible tensile strength rating of 270 lbs. per inch making it impossible to rip under normal use. The mesh comes in black, brown, white, beige, or green. Bordered on all four sides by a reinforced vinyl material with a rating of 387 lbs., the fence is kept from sagging and the necessary tension is maintained throughout at the top and bottom. The border can be considered the most critical part of the pool fence. All border is Quad Stitched with the strongest marine thread to allow for years of abuse from direct sunlight and the elements. Be sure your pool fence has four stitches in the border. The finished mesh is boarded then securely mounted on our solid core aluminum poles and reinforced with aluminum cove molding strips attached to each pole. The mesh comes in a variety of flavors to accommodate different tastes. We even can mix and match mesh color and border colors to custom blend with an individual’s backyard. If you want the highest quality Latch on the market trust Life Saver Pool Fence, the Snap Safety Latch, is a break-through in high quality pool fencing. This awesome latch is nickel-plated with a stainless steel spring, guaranteeing that it will never rust, corrode, tarnish, or deteriorate in any fashion. As with all parts of the Life Saver Pool Fence, the Snap Safety Latch is covered by our Lifetime Warranty. The Snap Safety Latch is the first pool fence latch that can be used by both right and left-handed parents. There are no sharp hooks or points to hurt you or your child. It’s the safest latching system anywhere. Be sure your pool fence has a nickel-plated Snap Safety Latch. This latch is standard and there is no additional charge. 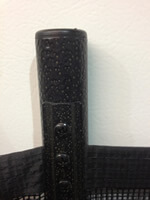 The highest level of security can be found in the Perma-Latch Clip. A stainless steel clip that requires a tool to open. The Perma-Latch Clip exceeds the requirements for nearly all codes and laws, including Nevada’s newest revisions. 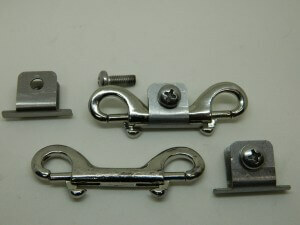 The Perma-Latch Clip is usually used in conjunction with a Self-Closing, Self-Latching Gate. The Perm-Latch Clip can be removed in the future for faster un-installing. There is an additional charge for this clip. Our nickel-plated latch will never rot, rust, corrode, tarnish, or deteriorate in any fashion. 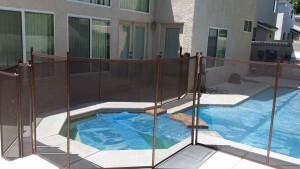 A professional installation through Life Saver Pool Fences of Nevada means a professional installation from start to finish. All our installers are factory trained. Every year they are required to take safety seminars offered through Life Saver in order to improve their installation techniques, be familiar with any new product upgrades, made aware of new installation tools that will provide our customers with a better installation. Though our original techniques and know how have been proven to provide perfect installation we are always striving to do better for our customer and job satisfaction. All Life Saver Distributors are under strict scrutiny from corporate. 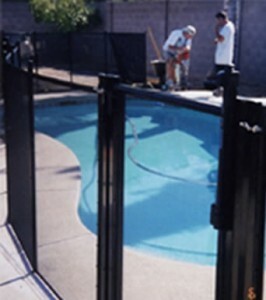 It is absolutely required under contract that a Life Saver Pool Fence must be installed according to guidelines. The most important tool used in our installations is the wet diamond core drill machine. The core drill machine is meant for drilling into all types of stone and can be retrofitted for wood drilling as well. 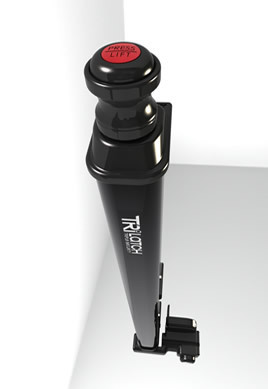 The core drill uses a water lubricated diamond tip bit. 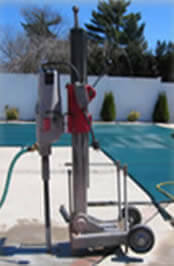 This ensures that we will drill a perfect 1 1/8″ hole into your blue stone, pavers, concrete deck, etc. without the threat of chipping, scratching, or breaking of the surface. Also our fence is based on a system known as bilateral tension. This means there is a constant force being exerted on the fence left to right. This force is important to keep the fence firmly in the ground and the Safety Snap Latches in between sections securely locked. However this cannot be achieved properly without the use of the core drill. The core drill machine is also free standing and has level adjustment rods that allow our installers to properly drill each hole on its appropriate angle. 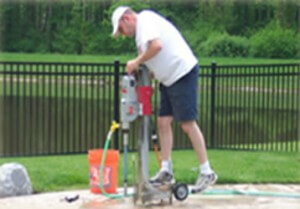 The average fence is 100′ around a pool with holes that need to be drilled every 3 feet. Can you imagine if an installer used a hand held machine to drill into your deck? You would end up with a fence that is not only crooked but would function properly and would be a waste of time and money. Beware of safety fence installers who use a hand held drill. Most of these hand held drills are what we, in the industry, refer to as hammer drills. These drills do exactly what they are called they hammer and they drill without the use of a water cooled diamond tip. This process can and in most case does result in surface chipping and breakage. 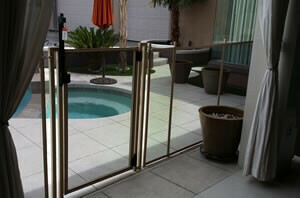 First we will come out and measure your pool and figure the proper way (keeping your concerns and considerations in mind) the fence should run in order to deny access to the water. We have numerous styles of fence that can be installed in a variety of considerations to match tastes, convenience, and budget. All our styles are equally as safe as the next. We only sell one grade of fence and that is the best. When it comes to budget, you will never have to compromise safety, only aesthetic. Once we have provided you with a job proposal and you are ready to book an installation appointment our typical time frame, even in the busy season, is anywhere from 2 to 10 days. We understand your importance for a safety barrier “yesterday” and this is why we do everything possible to furnish you with a Life Saver System in a timely fashion. Installation, 99% of the time is a one day job usually only taking a few hours. First we unload all tools and material for the job into the backyard. Next we will go over the layout with you to make sure nothing has changed from the estimate. Once you have provided our installer with direction and distance of the fence he will visibly mark it on your deck surface and show you once more to make sure that this is exactly how you would want the Life Saver System to run. All you have to do is O.K. the final layout and within a few hours you will be another happy parent with peace of mind. All of our factory trained distributors use wet diamond core drilling machines. This cuts a perfect hole into any stone surface to eliminate the worry of chipping or cracking expensive deck surfaces. 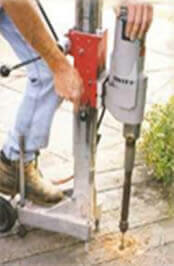 The same drill used for stone cutting is used to cut through wood decking by using an adapter. This allows us to give you the same quality installation in your wood surfaces too. Life Saver requires everyone who wants to install this fence to be professional trained. Its Life Savers way of promising you a professional, safe installation.